In which our correspondent attends five hours of Christian Marclay’s 24 hour film and learns much about how he feels about commitments and other people. Wait in line for a few hours, saunter into a dark and expansive theater where you’ll be standing anywhere from five to forty-five minutes to take a seat (all depending upon how polite or mercenary you are), and settle onto one of the couches (partitioned in sets of three) once a stranger has had enough. But be careful with the way you spend your time. Because once you leave the area, whether for snack or bathroom break, there’s no coming back unless you stand in the snaking queue again. Christian Marclay’s The Clock may favor the determined, but it’s something of a rigged game. Supply and demand is carefully calibrated by making the seats precious real estate. It’s a perfect laboratory for behavioral economist Dan Ariely to conduct new experiments. Yet the clips of people standing on train platforms or waiting in sordid rooms may strengthen your resolve to stay on your feet. Still, after a few hours, the impulse to slump into the next free seat only increases. Inside the room, the projected images are recognizable and faintly exotic, liberated from cinematic sources both pop and obscure, and ineluctably locked into the very minute you are experiencing. At 3:00 PM, Woody Allen shows up for his appointment with Mira Sorvino in Mighty Aphrodite and the joke about Sorvino’s prostitute telling Allen that she has “a great sense of humor” after showing him a clock with two fornicating pigs gets a new context. Little changes with Harold Lloyd’s famous clock-hanging moment, but when Peter Parker is fired for delivering a pizza late in Spider-Man 2, his fate at the hands of spoiled materialists is crueler because we are more aware of the temporal qualities. Then there are the cinematic moments in which one was never especially aware of the time in the original context, even when clocks were heavily involved. Cathryn Harrison throws an old woman’s alarm clock collection out the window in Louis Malle’s Black Moon, but did the actual time ever really matter? Patrick McGoohan secures the electropass watch to escape the Village in “Arrival,” but without the roaring white balloon or Number Two to taunt him, he could very well be confused with a disgruntled bureaucrat. Jack Nicholson’s droll wooing of Ann-Margaret as he sings “Go to the Mirror” in Ken Russell’s Tommy becomes less about seduction and more about a doctor using time as sparingly as possible. When we see Nicholson again in a clip from About Schmidt, waiting for the last moments of 5:00 PM to tick away on his last day in a drab and lonely office, I couldn’t help but wonder if his fixation on time caused him to lose Ann-Margaret. I had feared that The Clock would be a Wagnerian bauble: a novelty requiring only time and fortitude to embrace its contextual charms. But I discovered that Marclay’s massive opus tinkered not only with my passion for cinema, but upon my temporal prejudices. I experienced an undeniable joy for kitsch upon witnessing a preposterous fight scene from MacGyver and realized that my reverence for a certain period of 1980s cinema was more bountiful than expected. Yet I felt somewhat saddened when the film denied me clips of people fleeing the workplace after 5PM. I have always felt that there was something romantic about people liberated from their daily capitalist commitments to live out the true joys of their lives, but I didn’t feel The Clock properly acknowledged it. We do, however, see a moribund commuting moment on a packed subway. And I did notice that Marclay included a sad quotidian moment from Mike Leigh’s All or Nothing. So clearly the assumptive fault is mine. The Clock isn’t just about exposing our our enslavement to time. There is an inescapable physical component to this endurance test. If you are with friends, you may end up leapfrogging from couch to couch, slowly traveling back to your dear companions initially stranded in the IKEA archipelago. Because you are among an artistically sensitive crowd, you may find yourself throwing your dark coat over your head with a theatrical whoosh (as I did) to stub out the searing light from your phone as you text your coordinates to the people you came with, hoping that they will find you later. I witnessed some couples squeezing closer together, and I could suss out the degree to which friends wanted to be together by the way they raced to seating that had just opened up. But when a clip from Michael Powell’s Peeping Tom played, stretching my mild voyeurism onto the discomfiting canvas of Carl Boehm’s hungry and sociopathic eyes, I become consumed by tremendous guilt in watching other people. If cinema was a communal experience, why should I have to be punished for it? Was there something pornographic in being curious about others? Or was The Clock something of an impetuous tot stomping its feet for attention? I did feel that The Clock was very much a pleasant narcotic that was difficult for me to resist, yet these social concerns recalled Jason Rohrer’s Passage, a sidescrolling video game art project which confronts the manner in which you parcel out your life and pits individual ambition against love and communion. After nearly five hours inside Marclay’s fish tank, I was confident that I could spend at least four more, despite the fact that I had not slept much. But my companions had maxed out and I did not wish to abandon them. We went to dinner. I had no desire to look at the time. I spent the first few hours of the new year with THE CLOCK, and like you, found it irresistible & highly addictive. The late-night/early morning hours are filled with people screwing, people listening to other people screw, stake outs, bad dreams, lonely men walking down rainy streets, and people yelling “Do you have ANY IDEA what TIME it is! ?” I was exhausted, my happy drunk turning into a hangover, but I couldn’t leave until things finally got too busy for me around 6am. Like everybody else there, I did have my own couch though. 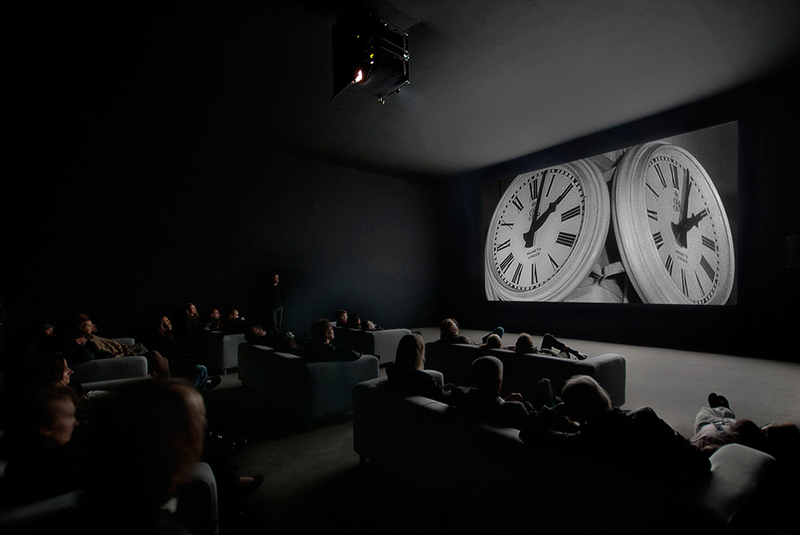 SFMOMA wastes time with Christian Marclay’s “The Clock.” This endless video mash-up has zero artistic value.